This attractive short layered look is razor-textured to created sharp contemporary tips for a trendy, modern finish! And creating a super creative contrast, the line is softened with lovely tousled curls on the top and sides. Keeping it casual, a couple of curly strands fall onto the forehead to soften the forehead. This style has plenty of movement and texture to keep the focus on Annette’s upper face and away from any signs of age. 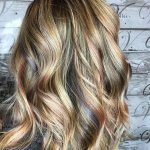 And the flattering, golden-brown shade catches and reflects the light for lots of natural highlights and colour dimension. Tucked casually behind the ears, this is a very good style for women of all ages who like a perky tousled look! Under: Popular Hairstyles 10 Exciting Medium-Length Layered Haircuts in Fab New Colors!